Legacy Fighting Championship returns with another MMA/Kickboxing hybrid card, this time in Lake Charles, La. The event will take place on November 13, at the Golden Nugget Casino. The card will be headlined by a middleweight title fight. 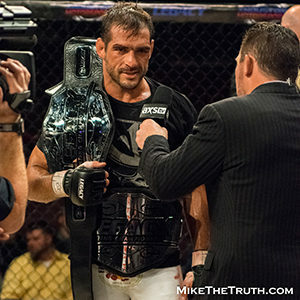 The current champion, Leonardo Leite, will be defending his belt against Ryan Spann. The card will also feature a one-night, four-man tournament to crown Legacy Kickboxing’s inaugural light-heavyweight champion. Brian Colette will face Manny Mancha in one semifinal, while Myron Dennis will meet Andres Van Engelen on the other side of the bracket. The light-heavyweight final will be the evening’s co-main event. The main card will air on AXS TV, starting at 9pm CST. The televised portion of the card will have four MMA bouts and three kickboxing fights. Two MMA matchups were also announced, as Kolton Englund will face Gage Duhon, while Trent Meaux faces Joel Scott. Josh Quayhagen is expected to fight on this card, but does not have an opponent yet. A reserve kickboxing bout between Chris Trammell and Matt Baker will also take place on the undercard.